Click the buttons to the right of the Listing Order Form for more information. This is not a bill means exactly that. This is an offer to list your company in our nationwide yellow page directory. Should you have any questions about this or anything else, please feel free to contact one of our customer service representatives at 1 (866) 752-8797 . In this section you will find your company's listing information. The record number you see is assigned by our company to easily identify you should you decide to advertise with us. You will also see your listing information such as your company name, address, heading and telephone number. Please make sure you carefully review all the information shown and that it's accurate. You can make changes on the reverse side of the form and you can add additional information like a toll free number, email address and website free of charge. THIS SOLICITATION OFFER IS FOR THE ORDER OF GOODS OR SERVICES, OR BOTH, AND NOT A BILL, INVOICE OR STATEMENT OF ACCOUNT DUE. YOU ARE UNDER NO OBLIGATION TO MAKE ANY PAYMENT ON ACCOUNT OF THIS OFFER UNLESS YOU ACCEPT THIS OFFER. TERMS ON REVERSE. A COMPLIMENTARY PRIORITY INTERNET LISTING AT WWW.US-YELLOW.COM WILL BE INCLUDED WITH EVERY YELLOW PAGES LISTING ORDER IN USY'S BUSINESS TO BUSINESS NATIONAL AND REGIONAL YELLOW PAGES. THE LISTING FEE FOR THE PRINT IS $259 PER quarter. THIS IS AN INDEPENDENT YELLOW PAGES DIRECTORY. USY IS NOT AFFILIATED WITH ANY LOCAL OR LONG DISTANCE TELEPHONE COMPANY. Here is your call to action; it's as easy as one, two, three. One, review your company information carefully and make sure it is accurate. Two, choose to make changes or not. If you find that changes are necessary, you can make them on the reverse side of the form. You can also opt to have your listing bolded for an additional $15 per quarter . And three, have a duly authorized representative of your company print and sign their name. Including your email address is optional, it's a trouble-free way for us to better communicate with you. Rest assured that we will not use this in any way to spam you or resell your information. All that's left is detaching the lower portion of the order form and mailing it back to us or you can fax the whole form to 1 (866) 702-8797 . This explains each facet of the terms and conditions between US-Yellow and your company. Please read carefully. We have highlighted below important terms not to be overlooked. View all the terms. 2. With each Yellow Page listing, a complimentary priority listing in the Internet edition (www.us-yellow.com) will be included. A printed copy of both the National and Regional Yellow Pages will also be distributed across the nation and within your region. 3. USY is a national and regional business-to-business yellow page directory. USY is NOT affiliated with AT&T, any Bell company and/or your local or long distance telephone company. USY does not publish the white and yellow pages customarily distributed in your area. This publication is not distributed to all telephone subscribers in your local area. The advertising fee is $259 per quarter. Each bold listing is $15 per quarter . A Priority listing is $30 per quarter . (By selecting priority placement your business listing will appear in outline.) You will receive your first bill when your order is received. This agreement shall be automatically renewed, until terminated by either party. Customers who choose to pay by credit card authorize USY to charge the customers' credit card used in payment on a recurring basis for each quarter's advertising fee. The customer has the right to discontinue automated payment at any time by contacting customer service at 1 (866) 752-8797 . 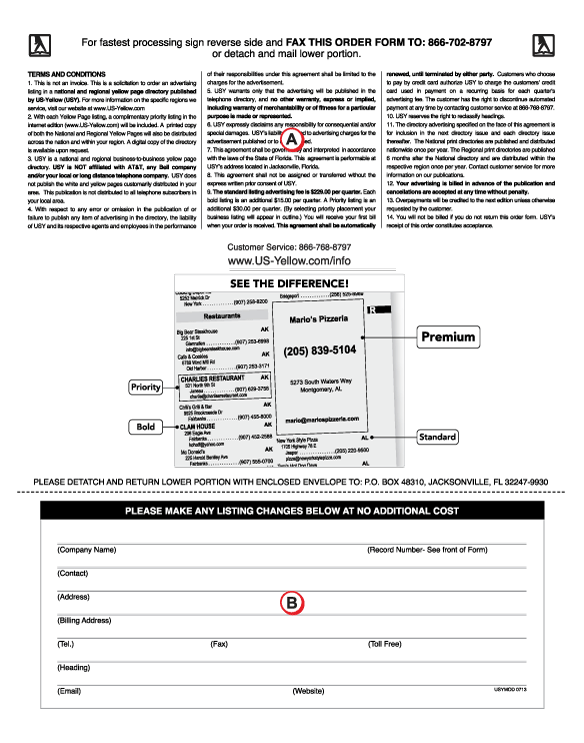 Your advertising is billed in advance of the publication and cancellations are accepted at any time without penalty. Find out more information about our cancellation policy. With each Yellow Page listing, a complimentary priority listing in the Internet edition (www.us-yellow.com) will be included. A printed copy of both the National and Regional Yellow Pages will also be distributed across the nation and within your region. USY is a national and regional business-to-business yellow page directory. USY is NOT affiliated with AT&T, any Bell company and/or your local or long distance telephone company. USY does not publish the white and yellow pages customarily distributed in your area. This publication is not distributed to all telephone subscribers in your local area. With respect to any error or omission in the publication of or failure to publish any item of advertising in the directory, the liability of USY and its respective agents and employees in the performance of their responsibilities under this agreement shall be limited to the charges for the advertisement. USY warrants only that the advertising will be published in the telephone directory, and no other warranty, express or implied, including warranty of merchantability or of fitness for a particular purpose is made or represented. This agreement shall be governed by and interpreted in accordance with the laws of the State of Florida. This agreement is performable at USY's address located in Jacksonville, Florida. This agreement shall not be assigned or transferred without the express written prior consent of USY. The advertising fee is $259 per quarter. Each bold listing is $15 per quarter. A Priority listing is $30 per quarter. (By selecting priority placement your business listing will appear in outline.) You will receive your first bill when your order is received. This agreement shall be automatically renewed, until terminated by either party. Customers who choose to pay by credit card authorize USY to charge the customers' credit card used in payment on a recurring basis for each quarter's advertising fee. The customer has the right to discontinue automated payment at any time by contacting customer service at 1 (866) 752-8797. USY reserves the right to reclassify headings. The directory advertising specified on the face of this agreement is for inclusion in the next directory issue and each directory issue thereafter. The National print directory is published and distributed nationwide once per year. The Regional print directory is published 6 months after the National directory and is distributed within the respective region once per year. Contact customer service for more information on our publications. Overpayments will be credited to the next edition unless otherwise requested by the customer. 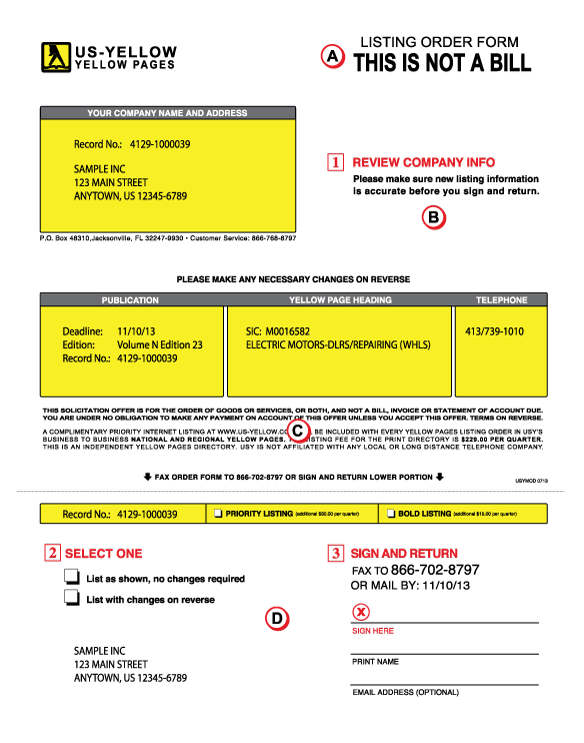 You will not be billed if you do not return this order form. USY's receipt of this order constitutes acceptance. Please make any changes or additions to your listing here. You can list all the information shown at no additional cost.